Just how many redshirts die in Star Trek, anyway? Screenshot: Star Trek "The Changeling"
Most Star Trek fans, at one time or another, have fantasized about stepping aboard the Enterprise, donning the Starfleet uniform, and blasting off into the great unknown at warp six. 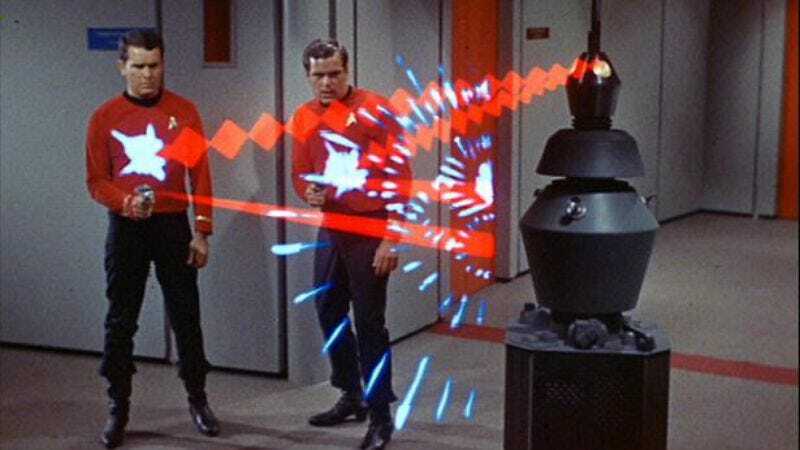 But if that fantasy is taking place during Kirk and Spock’s time, you’d better hope your uniform isn’t red. Someone being a “redshirt”—that is, a character the audience isn’t invested in and would be okay with seeing die—is a well-established trope in the sci-fi genre and is often used by fans to identify characters they predict won’t make it to the end credits. Galaxy Quest poked fun at the cliché with Sam Rockwell’s character Guy Fleegman, whose sole credit is Crewman #6. But the concept of being a redshirt has its roots in Trek’s original series, during which crew members died all the time, or whenever the writers needed a way to raise the stakes. It seemed every episode included a scene where a few of the beloved members of the main crew were transported down to a dangerous planet along with a couple red-shirted nobody security officers, one or all of whom would end up dead. But upon further inspection, the danger associated with being a redshirt may be more fiction than fact. Recently, mathematician James Grime gave a lecture entitled “Star Trek: The Math Of Khan” in which he explored the mathematical basis for a number of aspects of Trek lore, including the true fate of the ill-fated redshirts. Grime discovered that, statistically speaking, you have a better rate of survival as a redshirt than as a higher-ranked, gold-uniformed command officer. That’s because, according to the Starfleet Technical Manual, there are 239 red-uniformed security officers onboard the Enterprise, 25 of whom die on screen. But, there are only 55 gold-uniformed command officers, 10 of whom die on screen, making their mortality rate slightly higher (8 percent higher, if you want to be a nerd about it). Still, regardless of shirt color, the best indicator that a Star Trek character is going to bite the dust is that they were just introduced this episode and are standing precariously between a season regular and that week’s villain. But that’s the less mathematical approach.